When trying to see the Live View on internet explorer browser, it shows a warning message "Microsoft Visual C++ 2005 SP1 Redistributable Package is the necessary component to run this product. If you see this message after installing the ActiveX and allowing it to run, please download this program from Microsoft, or install vcredist_x86.exe from NVRmini tookit." 1. Your ActiveX Filtering function is turned on. 2. Your User Account Control (UAC) function is enabled. 3. Internet explorer 10 compatibility issue. 1. Please follow steps shown below for resolving the Cause point 1 mentioned. Step1: When you see the Visual C++ 2005 warning message window popped up, please go to upper-right side of the Internet Explorer (IE) browser. And find out a blocked symbol at the right hand side of the URL address bar as marked in red box. Click on the blocked symbol and another message window would popup showing "Some content is filtered on this site". Click on "Turn off ActiveX Filtering" to turn off IE browser ActiveX Filtering function. Step 2: Then it pops up another warning message window at the bottom part of the IE browser. The warning message says that "This webpage wants to run the following add-on: 'WebView ActiveX Control Module' from 'Not Available'.". Please click on "allow". Then the system will guide you to install the ActiveX, please click "install". 2. 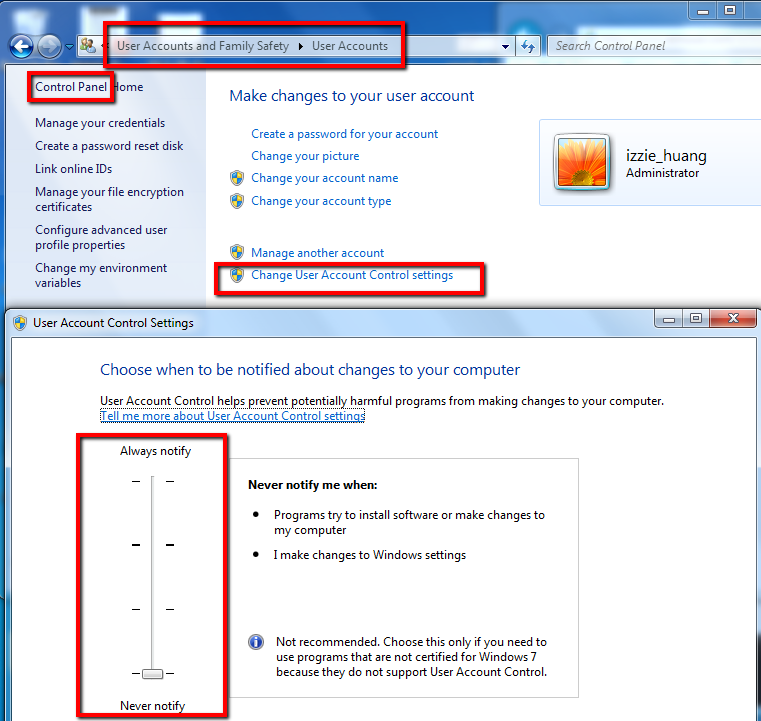 Please turn off your UAC as shown in below picture for resolving the Cause point 2 mentioned. (1) Please upgrade IE to latest version. (2) Otherwise, please run IE 10 in compatibility mode for resolving the Cause point 3 mentioned. Hit "F12" on the keyboard. Then select IE 10 Compatibility Mode.